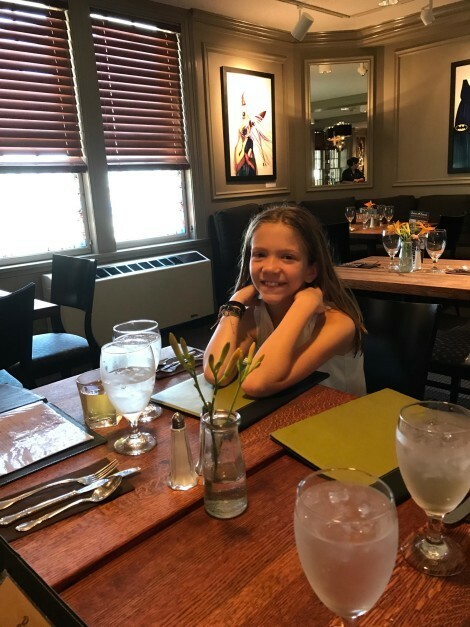 Many of our readers will remember the Brown Hound Bistro as a local favorite in South Bristol for over 10 years. 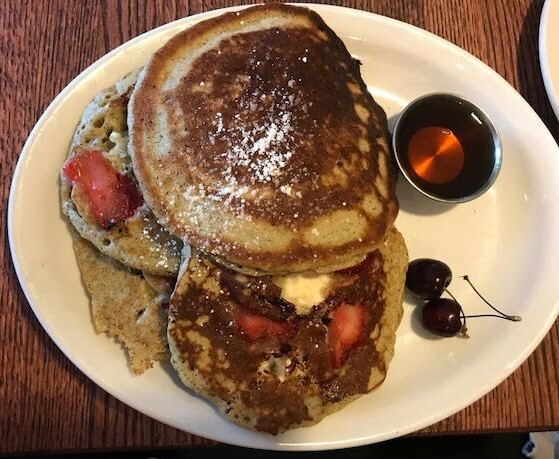 In 2016, Brown Hound Bistro owner Trish Aser, alongside co-owner Joe Scardilla opened a new restaurant, the Brown Hound Downtown right here in Rochester. 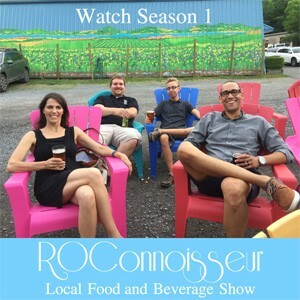 Their seasonal focus and farm-to-table concept remained, but the address changed. The new combination bakery and restaurant are located in the heart of Rochester in the Neighborhood of the Arts (NOTA) inside the beautiful Memorial Art Gallery. 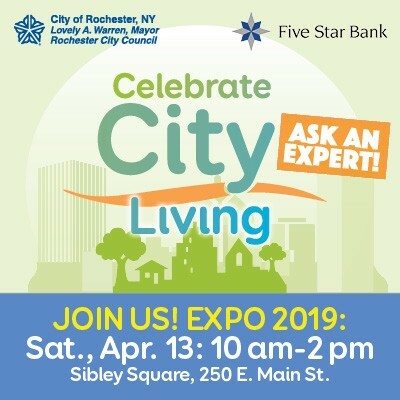 A mix of bistro, bakery, bar and caterer, patrons can choose to enjoy fresh baked goods and coffee in the downstairs bakery, dine in the interior dining room, or on the second floor which overlooks the atrium. The Bakery below. Glimpse into the Restaurant above. 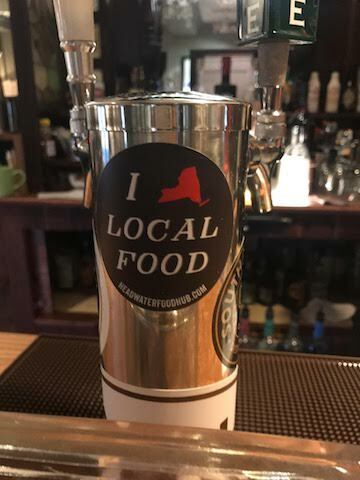 The bar features 100% NYS beer, wine and spirits. Admission to the Art Gallery is not required, and both convenient parking and Wi-Fi are also free, making it an ideal spot for a business lunch. Or, to stop in and enjoy the beautiful space while checking your email over a latte or fresh bakery item from the downstairs bakery. 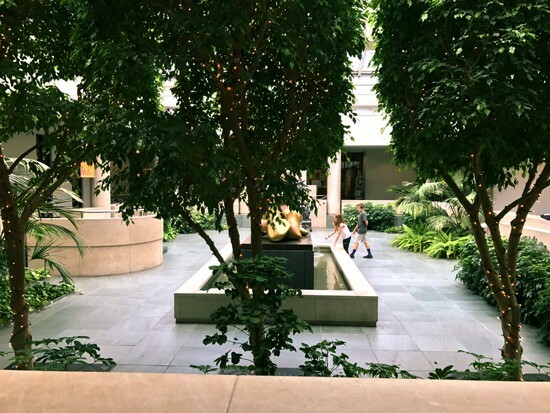 There are tables and chairs in the atrium, to sit and enjoy the beautiful and inspiring space. If you are like most of us, you probably welcome the opportunity to slow down once in a while. 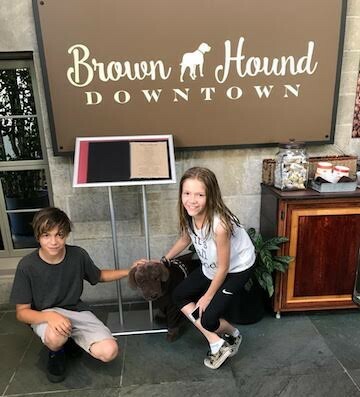 The Brown Hound Downtown is a great place to do just that. Henry, the brown hound for whom the Brown Hound is named, like many dogs, lives in the moment. Follow his lead and savor the experience while taking in the dog-themed artwork throughout the restaurant and savoring expertly prepared, locally sourced food and drink. There are nods to dogs throughout the restaurant including the stuffed animal hound on your way in. Thanks to their partnerships with area farms, Brown Hound is committed to serving local seasonal dishes, and their menu reflects that commitment, showcasing an array of fresh and unique offerings. The menu changes often in keeping with changes in the seasons, and new dishes are often inspired by the MAG’s visiting artists, more firmly tying food and art together. 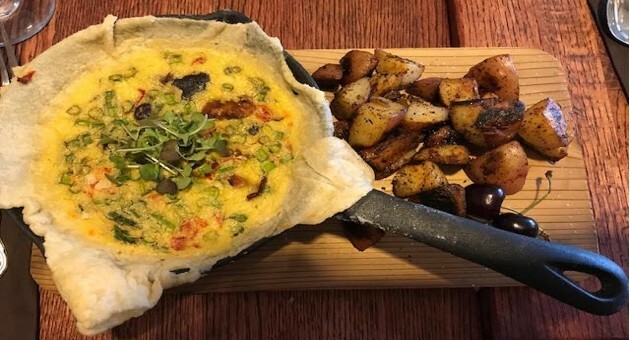 The Brown Hound is an ideal place for business lunch meetings, but they also have a great brunch which is served both Saturdays and Sundays. Our group of five went on a recent Sunday morning. 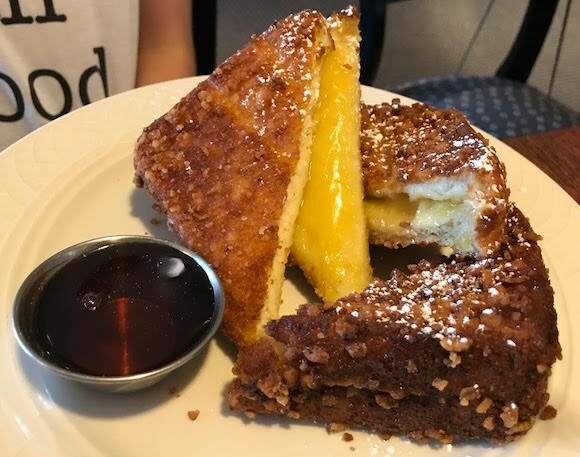 My youngest, Lucy, ordered the stuffed French toast. On this day, the French toast was stuffed with sweet and tart lemon filling. She was very pleased. My teen children, Abigail (age 17) and Harry (age 13), ordered the Ricotta Pancakes and Spring Tart (accordingly) and were equally happy with their choices.. Abigail enjoyed the “interesting mix of ingredients” and for Harry the Spring Tart (shown in top photo) was “off the chain.” The tart was a notable winner, comprised of puff pastry filled with goat cheese, onion marmalade, foraged chanterelles, fresh herbs, and cherry tomatoes. For literary purposes, I ordered two meals. 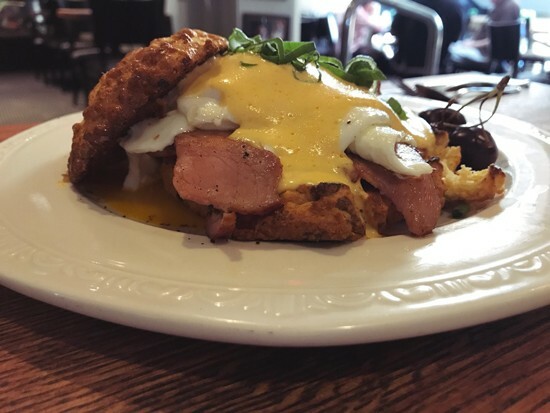 A specialty of Chef Paul Koecheler is the Country Bistro Benedict. Not usually a fan of spicy food for breakfast, I was pleased to find the spicy hollandaise sauce creamy and delicious with just the right amount of spice. 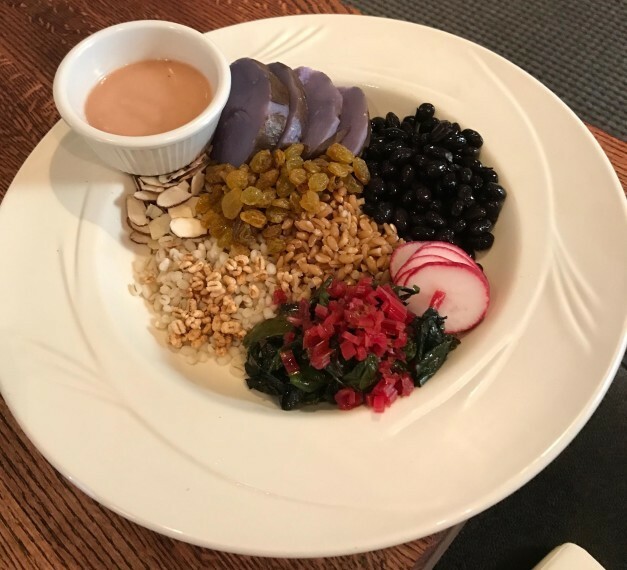 I also ordered the Grain Bowl, which is a healthy mix of grains, greens, a sliced purple potato (a new experience for me), and served with pickled ramp dressing. 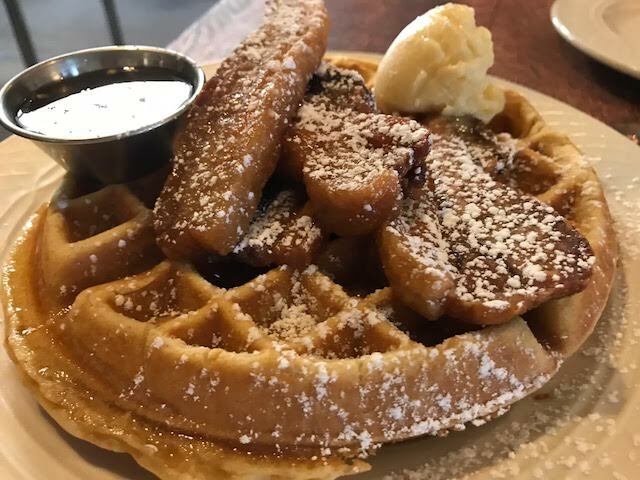 Our friend, Amy, ordered the Maple Belly Waffle; a fluffy waffle served with bourbon-glazed pork belly and maple syrup mixed with a special blend of other spices to compliment the meal. The Brown Hound Downtown follows the schedule of the Memorial Art Gallery, and is also open during First Friday, Rochester’s monthly citywide gallery night which takes place on the First Friday evening of each month from 6-9 PM. 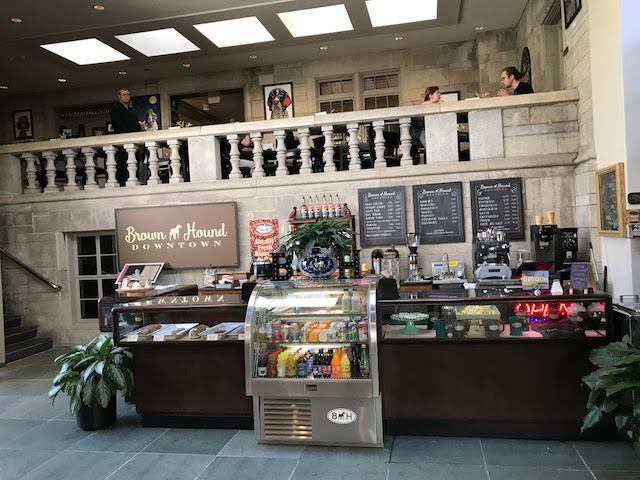 The location in the Neighborhood of the Arts also makes the Brown Hound Downtown an ideal walking destination or stop on your way to one of the city’s many events. 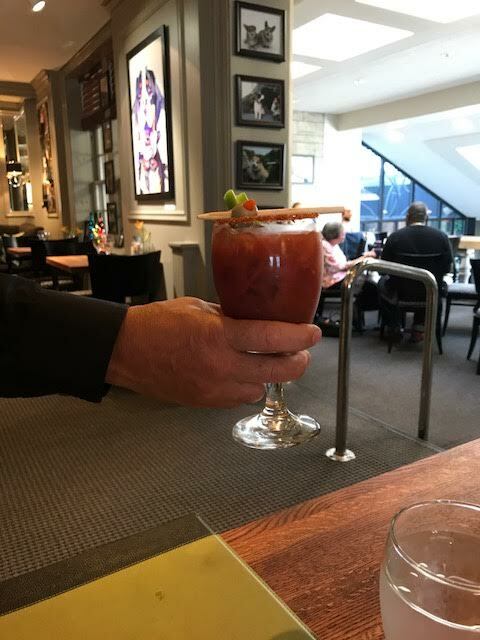 On Sundays, Live Music Brunch is 11am-1pm with Steve West’s folk/blues. My advice? 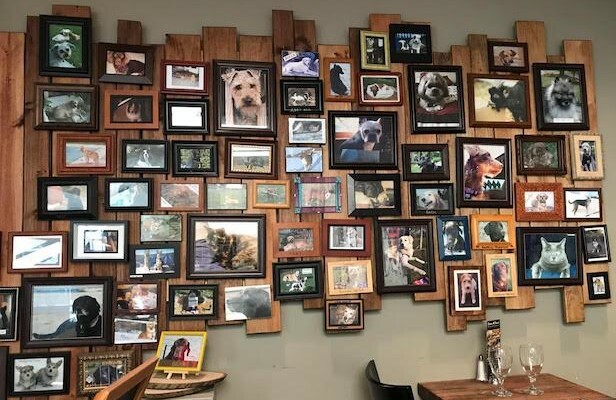 Take a leaf from Henry’s book (or perhaps a bone from his bowl), and visit the Brown Hound to slow down and savor a meal and surroundings memorable enough to make you forget your phone for awhile- with one exception; the chance to share a photo of your own beloved dog to their wall. Dog (and Pet) Photo Wall.